Exclusive: Matt Iseman Is the Arnold Catch-Phrase King! When TheArnoldFans was asked to work the red carpet with "The New Celebrity Apprentice" cast, we were especially excited to speak with Arnold, John Lovitz, Laila Ali, Patrick Knapp Schwarzenegger and Tyra Banks but we knew very little about some guy named Matt Iseman. Exclusive: The Boss Discusses the Psychology of the "The Apprentice"! On Friday, December 9th, TheArnoldFans took position on another red carpet for the latest Arnold Schwarzenegger project. First, the press was invited to sit indoors for a Q & A panel with the show’s talent. Exclusive: On the Red Carpet with Harrison Ford, Takei, & Shriver! Harrison Ford and Maria Shriver, among other great individuals who left a significant mark in California, were in attendance at the CA Hall of Fame ceremony on November 30th for their induction into the 2016 class. 7 STRONG Reasons Why Arnold Needs To Be Inducted into the CA Hall of Fame! The 10th class of California Hall of Fame inductees has just been announced with the gala event to follow on Wednesday, Nov. 30, held at Sacramento's California Museum. While I am impressed with the latest class that includes Harrison Ford, George Takei, Tony Gwynn, William J. Perry, Maria Shriver and other inspirational individuals, we are perplexed as to why Schwarzenegger, the iconic epitome of California, has not yet been inducted. Exclusive: Comedians on Arnold & Exercise! We often talk with Arnold, his costars and many action heroes but let's do something new; how about hearing from some famous comedians? Comic Con 2016 Survival Guide for Schwarzenegger Fans! After I first learned Arnold Schwarzenegger made a special visit out to San Diego Comic con in 2002 to promote T3, I’ve done my very best to attend the pop culture festival annually. I believe 2016 will be my 12th San Diego Comic Con and once again, I’ve got my press badge to report on all things Arnold to the greatest and most pumped-up online community! Exclusive: T2 Stars Give Statements on 25th Anniversary & 3D Release! Well, aren’t we all feeling OLD today! Can you believe it’s been twenty five years since the release of Terminator 2: Judgement Day on July 3rd, 1991! This brings us cause for a monumental worldwide party so join us in the fun as we celebrate all day long on Facebook and Twitter. Terminator Genisys T-800 Schwarzenegger Guardian Review! Shipping NOW from Sideshow Collectibles, this all new 1/6th scale T-800 Schwarzenegger Guardian action figure will be a fantastic addition to your Arnold and Terminator collection! I’ll Be "Bloks": Terminator Genisys Kubros Figure! 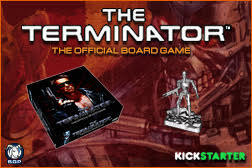 It’s nice to see Terminator Genisys merchandise continue on, proving fans are still out there for the franchise and there continues to be demand for T5 collectibles. In a few days we’ll tell you about some all NEW Genisys merchandise nearly ready to be unveiled, but for now, we can tell you about this new Kubros block figure.